At the conference, Benett introduced a new report produced by the World Travel & Tourism Council in partnership with Bloomberg Media Group. 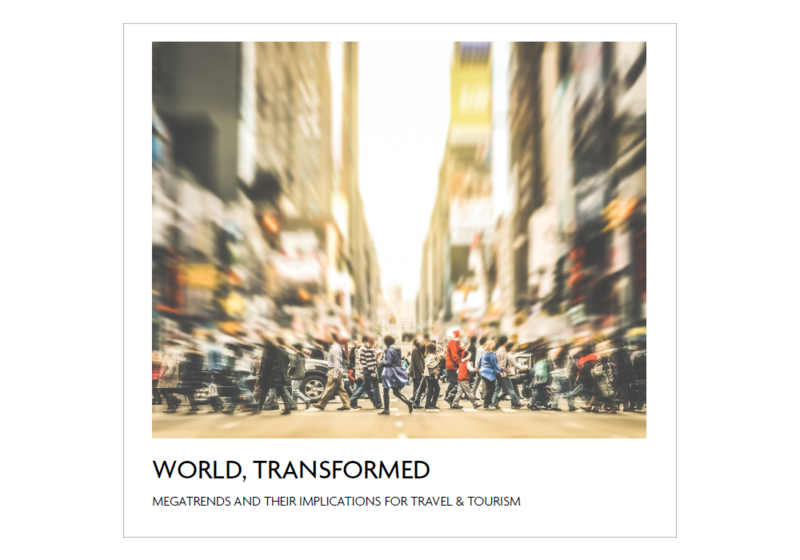 The report, World Transformed: Megatrends and Their Implications for Travel & Tourism, provides a data-driven look at five global trends that can guide such future-focused strategic thinking. 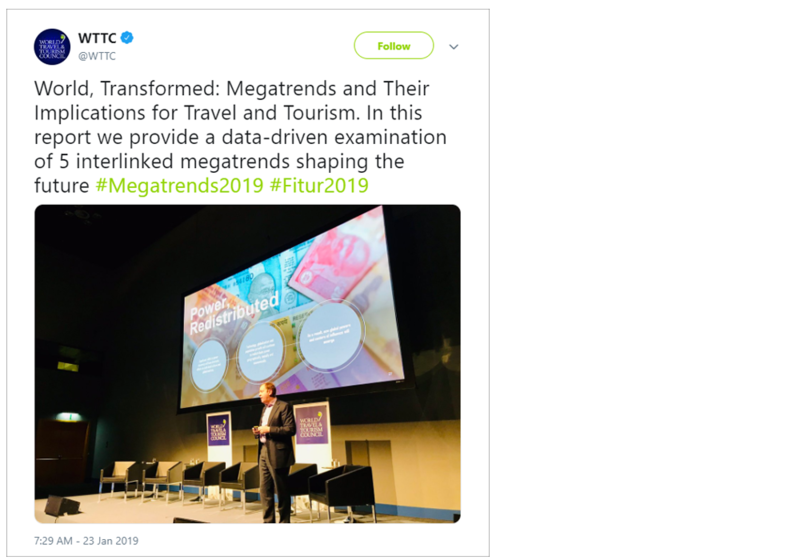 Andrew Benett introduces World, Transformed: Megatrends and Their Implications for Travel and Tourism at the FITUR conference, January 23, 2019. Incorporating Bloomberg’s proprietary intelligence and the World Travel & Tourism Council’s expert perspective, the report’s findings distill how the way we travel is changing in an era defined by rapid shifts across technologies, societies, and economies. These converging forces have distinct implications for travel and tourism businesses, from airlines to hotels to national tourist boards. Yet they also apply outside it, Benett noted. “It’s important when we look at megatrends to consider not only the implications for this sector, but also translate them out,” he said, since travelers, workers and governments all function within dynamic networks overlapped across multiple other sectors. 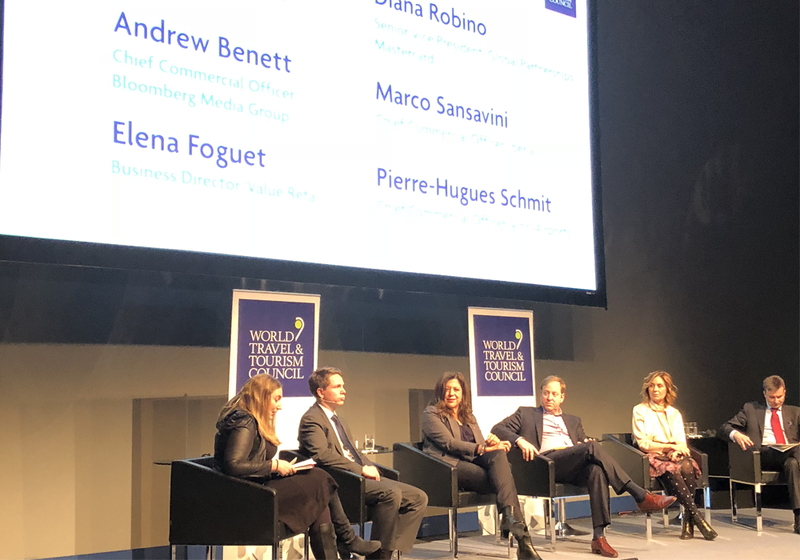 Bloomberg Chief Commercial Officer Andrew Benett, fourth from left, joined a panel discussion of the megatrends and how businesses can prepare for what’s ahead at the FITUR travel conference. The panel also included Tiffany Misrahi, Policy Director, World Travel & Tourism Council (moderator); Marco Sansavini, Chief Commercial Officer, Iberia; Diana Robino, Senior Vice President, Global Tourism Partnerships, MasterCard; Elena Foguet, Business Director, Value Retail; and Pierre-Hugues Schmit, Chief Commercial Officer, Vinci Airports. Reality, Enhanced: New ideas and beliefs are emerging about how best to live a connected life. Online and offline experiences are becoming increasingly integrated, as technologies are adapted for analogue experiences. The experience economy is growing, in addition to an increased emphasis on physical and mental well-being. And so is the potential to design meaningful, unique, frictionless and even unplugged journeys that directly respond to these changing values. Life, Restructured: Tech-powered economies continue to create new expectations for work, life and culture. Twenty-five percent of workers in the US and EU engage in independent work today, and that’s only going to grow. As people’s lives become more fluid and self-directed, travel will become more of a lifestyle. Mobility will increasingly become communal and service-based. Businesses will need to consider how these shifts affect both their customers and their workers. Data, Revolutionized: New data-powered technologies such as the Internet of Things, facial recognition and voice assistants have the capability to build fluid, cohesive travel and retail experiences. Yet consumers remain uneasy when it comes to their security and privacy. Businesses will need to lean into brand values to guide their innovation and prioritize transparency with their customers. Power, Redistributed: Significant shifts in power dynamics will have dramatic effects on both local culture and global markets as technology, globalization and population growth continue to redistribute power. These forces create new centres of social and economic influence in the East and South. Understanding future consumers will be as important as establishing presence in new markets. Businesses will need ensure their brand has a point of view in the global, social discussion. Consumption, Reimagined: As the availability of resources and health of our planet are increasingly threatened, there is a need for responsibly balancing short and long-term priorities. Sustainable business practices and solutions can become the core of a robust growth strategy for the travel and tourism sector. Safeguarding destinations, environmental leadership and community health will therefore be integral to the customer experience. With the rules of engagement changing, the full report offers a wealth of detail and data to guide decision-making — including infographics and a look at how businesses and destinations are already responding to these trends.